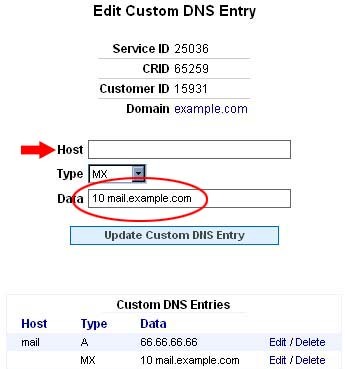 This article illustrates and explains how to configure Custom DNS for customer hosted E-mail Services. 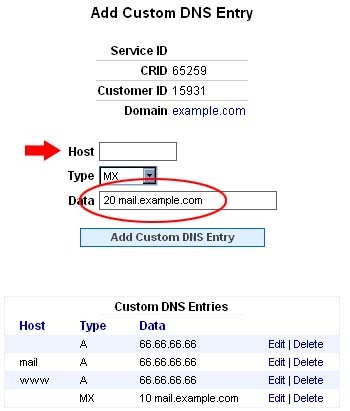 When setting up a Domain Service for customer hosted E-mail Services, compare it to the example below. Two main things to remember are to have the 'E-mail Service' set to customer and also to make sure that the 'Custom DNS Service' is set to "Yes." 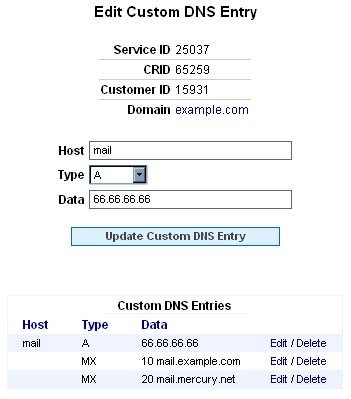 The Custom DNS record below is the A-Record needed for resolving DNS requests for the customers mail server. This associates the MX (Mail Exchange) Record with the IP address assigned to the mail server. 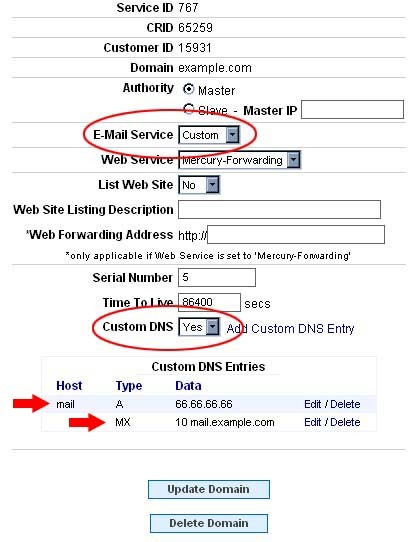 At the bottom of the example you can see the other custom records setup for the Custom DNS E-Mail service. This is the record that will handle mail requests first. If, for some reason the Primary Mail Handler is not responding, it will be sent on to the Secondary (or Back-Up) Mail Handler. It is absolutely imperative that each of these records include space before the priority number as shown above. For customers who use us for Slave DNS, we would automatically provide back up queuing of E-mail incase there servers go down at any point.